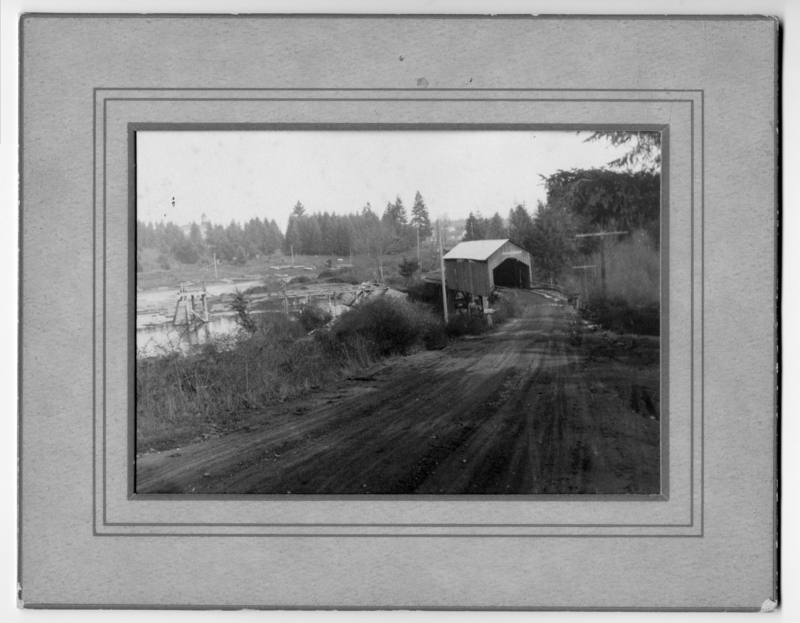 This is the old covered bridge on McVey St. by the dam of the lake (crossing Sucker Creek), where it runs into the creek. Old school is in the background to the left. Edith's folks (John Bickner) at that time lived on the hill above the bridge to the right when I got this picture, they now live on State & B. (Oct. 1964) From John Bickner's (Edith Brown). Carpenter who built bridge "Uncle Pope" James K. Poke Worthington (Earl's Uncle) Rolly's Dad. also built other covered bridges around here. Also iron foundry second one after first one burned. Helper Theodore Worthington. Description Matted on cardboard. Scanned as b & w. Same as 845b, c, & d and 1645, but cropped differently. Now called McVey St. Bridge. Transcription This is the old covered bridge on McVey St. by the dam of the lake (crossing Sucker Creek), where it runs into the creek. Old school is in the background to the left. Edith's folks (John Bickner) at that time lived on the hill above the bridge to the right when I got this picture, they now live on State & B. (Oct. 1964) From John Bickner's (Edith Brown). Carpenter who built bridge "Uncle Pope" James K. Poke Worthington (Earl's Uncle) Rolly's Dad. also built other covered bridges around here. Also iron foundry second one after first one burned. Helper Theodore Worthington. Physical Description H 4.5" x W 6.5"